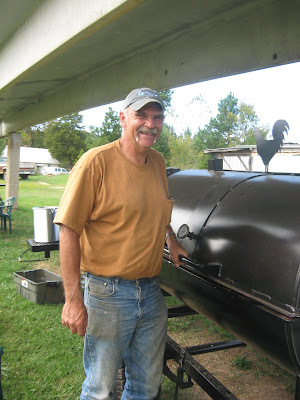 This good old boy from western Rowan County knows how to throw a barbecue. Everyone was quite impressed with his pork shoulders this weekend. So - you want to be a great grill chef? It's always nice to get a pat on the back when you take the time to make a meal - especially an outdoor meal on the grill. Face it. It does take a lot of work to put together a terrific cook out. With this in mind, the Hearth, Patio & Barbecue Assocation conducted a poll this fall. They asked a number of questions including, "What makes a great barbecue griller?" HPBA does surverys throughout the year, and they always send me an e newsletter. I really enjoy their questions and findings, and I'm glad they let me know what's going on in the barbecue world. Don't wait until you're perfect to have a cook out. You may never get around to doing one. Most of my barbecues turn out fabulous. I do remember one where nothing went right. I ordered in pizza. Everyone had a great time even if we didn't get to eat the grilled food which burned to a crisp while I was hanging clothes on the line. So, that's another tip - multitasking is not such a great idea if you want to be a wonderful barbecue griller.